Braydon has been accepted as a patient in the on-going FDA study of the Titanium Rib Project. (Click here to visit the TRP website.) He had double titanium rib implant surgery on August 15, 2001. Click here for a photo journal of Braydon's stay in the hospital for his implant surgery. Click here for a photo journal of Braydon's stay in the hospital for his implant surgery. Click Here for Expansion Updates! VEPTR progress! You can see how well-balanced Braydon's back is after 5.5 years of VEPTR expansions. The photo on the left is pre-VEPTR surgery (age 6yrs). His hips are uneven, his shoulders are uneven, etc. The photo in the middle was taken Mar. 2005. Surgery re-aligned his hips and shoulders, gave his chest fullnes, better body balance, etc. The photo on the right was taken Mar. 2007 - still growing and staying well-balanced! 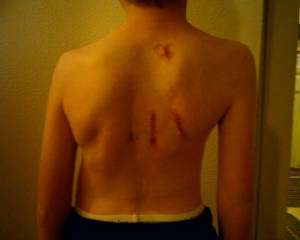 Even after tethered cord re-release in Dec. 2006, his incisions heal very well which makes repeated surgeries easier. Braydon had surgery on August 15, 2001. They implanted two adjustable titanium rods in his body. One was placed in his ribcage to expand his chest (the right side, after they cut apart the ribs that had fused together) which gave him 2 full inches and 40% more lung capacity in his right lung. His oxygen sats were great! I didn't realize how serious the lung function (or lack of it) was for him. The thoracic surgeon told us after the surgery that he would have eventually lost his right lung completely. How frightening is that? Secondary to getting him more lung space was the hybrid rod in his back. They placed another rod in his back to stabilize his spine and correct part of his severe scoliosis. 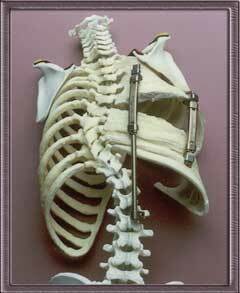 The rod is attached at the top to a top rib, and the bottom is attached to a lumbar vertebrae. His hips are now LEVEL! He has never been so well-balanced. His body alignment is going to be a work-in-progress. Over then next few expansions (every 6 months) they will adjust the rod in his spine to give his body better balance and continue stablilizing the spine. Also, now that his hips are level, we confirmed (via bone scan xrays) that his legs are more than 3cm different in length. His right leg (the clubfoot leg) is shorter than the left. His limp is still quite prominent, so they prescribed a lift for his shoe to see if that helps with the foot/leg problems. Braydon was patient #137 overall in the Titanium Rib Project. Click here for an article describing the device (VEPTR) used in Braydon's surgery. This model shows how the rods are implanted in a Titanium Rib patient. It also shows how the surgeons cut apart ribs that have fused together to expand the size and capacity of the chest, giving the lung(s) more room to grow. Braydon's implants are almost identical to this model (Braydon had 2 sets of ribs separated)... kinda cool! Mar 2005... Braydon's back after his 7th VEPTR expansion. His right shoulder seems almost overcorrected. Scapulas are even and his body is well balanced.